Manfrotto’s new 608 and 612 Nitrotech Fluid Video Heads have a unique Nitrogen piston mechanism which the company says will guarantee continuous counterbalance even when the camera is tilted. They also have a brand new fluid technology for smoother and more realistic cinema-style footage, with variable continuous fluidity on both the pan and tilt axes for smooth, judder-free movement. Regular tripod heads are fine for static shots with no camera movements, but if you try a panning shot it’s likely to be spoilt by stickiness and judder and irregular movements. That’s why you need a proper fluid video head. This is why the best video tripods and video heads are a breed apart from regular camera tripods because they need to allow for ‘live’ camera movement while filming and aren’t just static camera supports. It’s not just panning movements which need to be smooth, but tilt movements too, and this is where the Nitrotech system comes in. Its Nitrogen piston maintains the balance of the camera so that it doesn’t shift forward or back as you change the angle. The Nitrotech 608 and 612 heads partner perfectly with Manfrotto's video tripod range (sold separately) but can be used with other supports. The new Nitrotech 608 and 612 are part of Manfrotto’s Nitrotech 600 series. The number at the end indicates the load capacity, so the Nitrotech 608 is for cameras and lenses up to a total of 8kg, while the Nitrotech 612 can support weights up to 12kg. 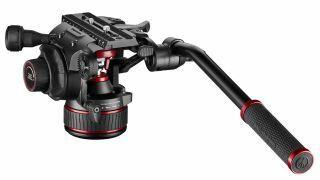 The new heads feature Manfrotto’s 3/8” anti-rotation Easy Link attachment for adding accessory arms to hold monitors or other accessories, and the head has a side-locking sliding plate for qui and secure camera attachment. The flat base mound has a standard 3/8” thread for different support options such as a slider, jib or crane. All of this puts the Nitrotech heads firmly in professional video territory, so they’re designed for more advanced content creators, vloggers and videographers working both in a studio and on location outdoors. The new heads go on sale in the summer of 2019, with prices yet to be confirmed.